Citi consistently scored 100 percent on Human Rights Campaign Foundation’s Corporate Equality Index for the past 14 years. The achievement was the inspiration for a June 2017 campaign celebrating Pride in New York City. This campaign won Best in Show for Multicultural Integrated Marketing at the FCS Portfolio Awards and Bronze for Corporate Image Integrated Marketing. Because Citi had such an incredible reputation for an inclusive work environment, we reached out to LGBTQ employees to share selfies for use in a mosaic that formed a meaningful mosaic overlaid with the Pride flag stripes of color. This visual informed most of the communications we executed for the Citi Pride 2017 campaign. A print ad in the official publication celebrates Citi employees that are out and proud. 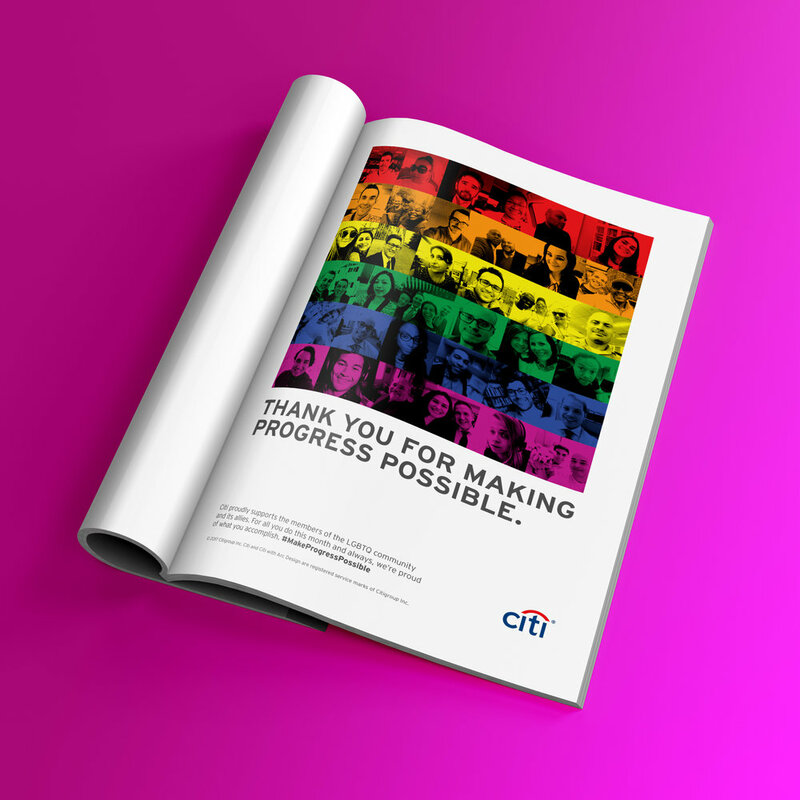 The rainbow color palette that highlights the faces of Citi's LGBTQ community members in other communicatiosn for this campaign is used to diagonally fill the "make progress possible" messaging against a dark Citi Blue background for maximum impact on the parade t-shirt. Citi employees that shared their selfies for the original photo mosaic also told their Pride stories in cheerfully likable Instagram posts. We worked with an event planner to design an official Pride parade float featuring visuals and messaging from other parts of the Pride campaign. It was also the perfect space for Citi LGBTQ employees to show their pride in the parade. Pride ads appeared at CitiBike stations, retail locations, bus shelters, and subway stations.